How should I inflate my Gym Ball? When you receive your Gym Ball unwrap it carefully. Some are packaged very tightly wrapped, and if you use a knife or sharp object to open the package you may very well pierce the Gym Ball. Lay the gym ball out as flat as possible on the floor, keeping it out of the sunlight. Remove the plug in the ball and fit the pump nozzle into the plug hole. It is best to use a pump made specifically for gym balls. Inflate the ball to about 70% of its size; take the nozzle of the pump out of the hole and quickly replace the plug. It is then advisable to then let the ball rest for about 24 hours. After 24 hours finish inflating the ball to the size you require; your hips and knees should be parallel to the floor giving a 90 degree angle. When inflated the exercise ball should be quite firm but not hard. When using the ball it should react to your body shape and give it support where needed and improve your posture. 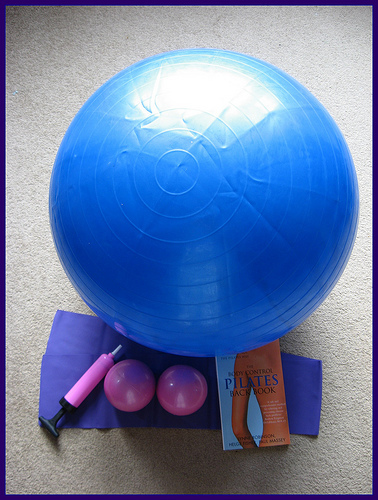 If you are using your gym ball as a seat it is better to have a size bigger than you usually need and then slightly deflate the ball so that it is nice and comfy. Remember, the firmer the ball the harder it is to balance and therefore the exercises are harder to do. Never inflate your gym ball over the specified size.